A few days ago, Tindalos Interactive and Focus Home Interactive announced the development for PC of Battlefleet Gothic: Armada 2 with a Reveal Trailer. Today, discover our new video Forging a Sequel and meet our passionate team of long-time Warhammer 40,000 fans behind Battlefleet Gothic: Armada, the real-time strategy game that portrays the epic space battles of the Warhammer 40,000 universe. Discover never-before seen footage of the game, and learn what makes Battlefleet Gothic: Armada 2 a full-blown sequel! 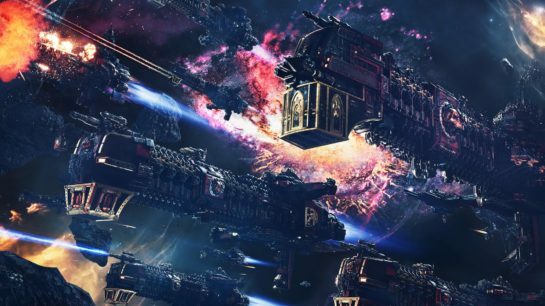 Romain Clavier, CEO & Game Director, and Aurélien Josse, CEO & Art Director, describe their ambitions and how we are making Battlefleet Gothic: Armada 2 better than its predecessor in every way. For the first time in a video game, the latest story development in the Warhammer 40,000 universe,Gathering Storm and the 13th Black Crusade, will serve as the canvas for the story of several dynamic campaigns. The game will also bring all 12 factions from the original tabletop game, playable in both solo and multiplayer, including the highly anticipated Necrons and Tyranids. With bigger battles, refined gameplay, improved multiplayer modes and features for a better and more balanced online experience, improvements across the board and even more customisation options for fleets and ships, Battlefleet Gothic: Armada 2 promises to be the ultimate Warhammer 40,000 space battle experience! Finally get a sneak peek of the creative process at the studio, a team passionate about the Warhammer 40,000 universe since our childhood – a passion that followed us to this day and is evident in our work. Battlefleet Gothic: Armada 2 is planned for release on PC in 2018, and will be first presented to the press during Focus’s yearly event in Paris, le What’s Next de Focus, on February 7-8.